Morden Fireglow - Out Of Stock! This unique hardy shrub rose features double scarlet orange flowers from early summer through into fall on a vigorous upright form. 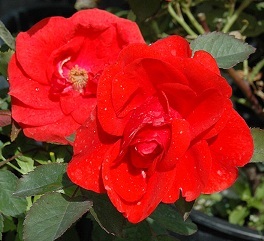 The iridescent red flower color is truly distinctive and makes a fine color accent for any flower bed. The Morden Fireglow Rose is clothed in stunning tomato-orange flowers with a scarlet reverse at the ends of the stems from late spring to late summer. The flowers are excellent for cutting. It has dark green foliage throughout the summer turning yellow in fall. The fruit and bark are not ornamentally significant. 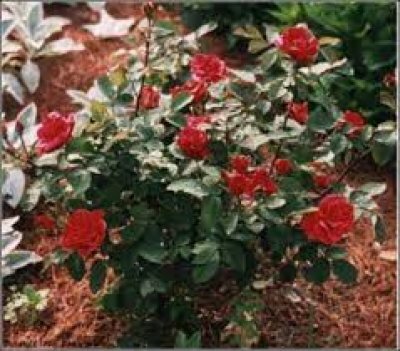 This is a moderate maintenance rose that will require regular care and upkeep. Removing the spent roses (dead-heading) before they form rose hips will ensure continued reblooming throughout the summer. Shaping the bush is best accomplished in late winter once the threat of extreme cold has passed. The Morden Fireglow Rose will grow to be about 3 feet tall at maturity, with a spread of 2 feet. Its foliage tends to remain dense right to the ground, not requiring facer plants in front. It grows at a fast rate, and under ideal conditions can be expected to live for approximately 20 years. This rose should only be grown in full sunlight. It does best in average to evenly moist conditions, but will not tolerate standing water. Placing the Morden Fireglow Rose in front of a dark back row such as Preston Lilac, Diablo Nine Bark or Schubert Cherry will provide the contrast to bring out the Morden Blush's flowers and fall colour. The glowing red flowers have28 petals each. The unique flower colour was the result of laboratory-based selection based on petal pigments.